In a tragicomic incident, a jeweller from Jalandhar was cheated of Rs. 1.90 lakh worth of jewellery by a couple using fake currency. On October 22, the couple went shopping at the jeweller’s shop, selected 56gm of gold jewellery worth Rs. 1.90 lakh, and paid the jeweller in fake currency before beating a hasty retreat. Speaking to press, the shop owner, Shyam Sundar Verma, said that he realized the fraud only after the couple left. Having selected particular gold ornaments, the couple had handed the jeweller a polythene bag full of notes, before leaving in a hurry. 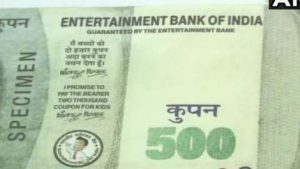 On further inspection, Verma found that the notes had ‘Entertainment Bank of India’ written on them instead of Reserve Bank of India. After realizing that he had been duped, Verma lodged an FIR against the couple at the Jodhan police station in Jalandhar. Subsequently, inspection of CCTV footage by the police revealed that the couple had arrived at the store in a car that did not even have a registration plate on it. Currently, a hunt to nab the couple is underway.